2x3.5 Custom printed business card magnets 20 Mil round corners will ensure that your customers see your business information every day. These personalized business card magnets are ideal to carve a believer out of critic or non-believer. These business card magnets will stick over customer’s refrigerators for the long haul. You can quiet all your critics with these personalized products and watch your recognition grow and touch heights. 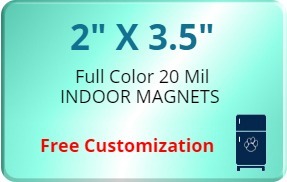 These personalized magnets are ideal for every company, business and individual trying to attract attention. Order today to get started! 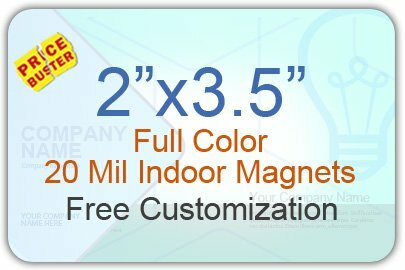 Request a quote to know savings that you can pocket on bulk ordering these 2x3.5 Custom printed business card magnets 20 Mil round corners. Product Weight: 7 lbs per 500 magnets.